Just by taking a train ride across my home city I can see truss bridges like the one in above picture everywhere. There are numerous variations, but the most common design seems to be this. But why are they built specifically this way? I can intuitively kind-of see why such a design probably is strong, but is there any kind of in-depth reason? I would be interested to know the answer as much from the physics side of things as possible. Googling didn't help much; I could find information on the different variations and many examples, but none really covered what is it about this design specifically that makes it so popular. That looks like a Pratt truss. These trusses have diagonals which go from the outer-top nodes to the inner-bottom nodes (i.e. they connect to the top chord on the node furthest from the center of the span, and to the bottom chord on the node closest to the center). This design means that the diagonals are under tension and the verticals are under compression. Another famous design is the Allan truss, which is the exact opposite: the diagonals go from the inner-top nodes to the outer-bottom nodes, which means that the diagonals are under compression and the verticals are under tension. 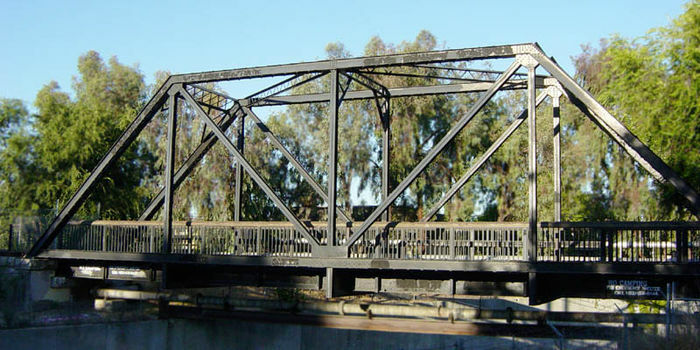 The reason the Pratt truss is so common in steel bridges is because it tends to be more economical. This is because steel works better under tension than under compression. Under tension, steel can theoretically operate very close to its yield stress. Under compression, however, there's the risk of buckling. Buckling is a behavior of slender elements under compression to effectively collapse at loads far below their yield stress (think of the classic "compress a ruler from both ends" experiment). "Slender" here means beams which are very long and with relatively small cross-sections (see Wikipedia's slenderness ratio page). Steel beams are frequently slender and therefore buckle under compression (as opposed to simply being crushed). The longer the element, the smaller the buckling stress and, therefore, the larger the beam's cross-section must be to resist buckling. So, with the Pratt truss, the verticals are under compression and the diagonals are under tension. As can be clearly seen in the image (or derived from geometry), the diagonals are longer than the verticals. Therefore, the diagonals' buckling load is smaller than the verticals'. So the advantage of the Pratt truss is that material tends to be used more efficiently: the longer elements have as small (and therefore light and cheap) a cross-section as possible by "sacrificing" the shorter elements. This works because those shorter elements require a smaller "upgrade" to resist buckling than the longer ones. * Note that when I say above that, for example, "the verticals will have a larger cross-section", I don't mean that the verticals' cross-section will be larger than the diagonals'. I mean only that it will be larger than if buckling weren't an issue. Why are three way bridges rare? Are pontoon bridges being considered to extend bridge span? How many units of HB are used for steel bridges? How accurately are moveable span bridges balanced? Why are earthfills fully covered in concrete where they join bridges? Why are concrete bridges more prevalent than steel bridges in the United States? Why aren't there moments in truss bridges? What are the factors that made narrow-gauge railways cheaper in the early 1900s, and are they still applicable today? How do I calculate the reactions in this truss?